Here in Pittsburgh, we are currently in the midst of winter and are trying our best to stave off the effects of frigid wind and plentiful snowfall. When the cold is just relentless and shows no sign of giving up, I always reach for a delicious comfort food dish. 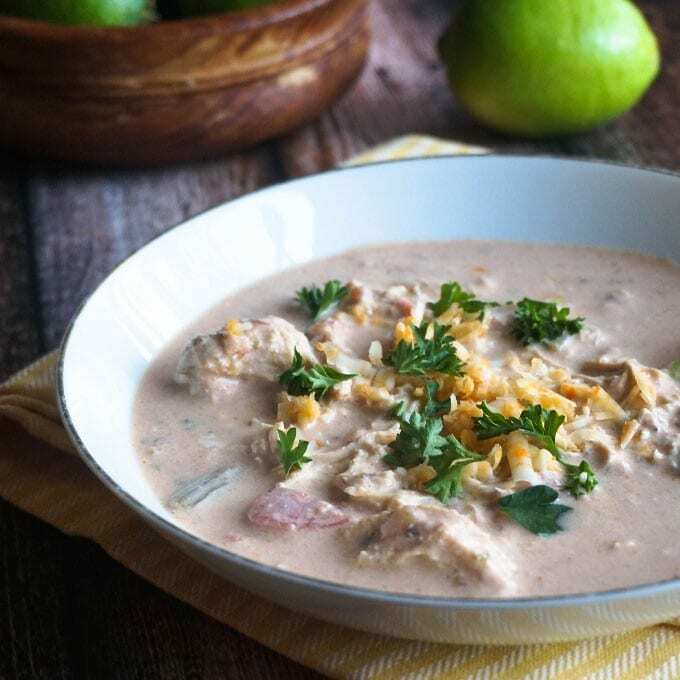 One of my favorites is my Low Carb Fiesta Lime Chicken Chowder. While the soup itself is warm and comforting, the south-of-the-border flavors radiate a much needed *pop* that will perk you up and fill you with energy! Who couldn’t use a little fiesta when everybody else wants to mope around and take a ciesta? Best of all, the ingredients are thrown in a crock pot, making your dinner simple and easy to clean up! For my Fiesta Lime Chicken Chowder specifically, I always shred the chicken to make sure that each bite contains all of the ingredients. Other times, I won’t shred the chicken and just leave it as is, spooning the delicious sauce over the top and any vegetables that I’m serving! If you are looking for a great make ahead meal that you can freeze or eat throughout the week, this is definitely one of them! I like to keep a couple containers full of this soup in my freezer and in just minutes on the stove top, I have a hearty meal ready for me! Low on time or lazy? Instead of preparing each individual ingredient, simply combine chicken, cream cheese and a container of your favorite salsa in the crock pot and let it cook! I like to use the fresh salsas offered at the grocery store — they work great! Looking for another delicious soup that will warm you heart and soul? Check out my Zuppa Toscana! Combine all ingredients into crock pot and set on high for at least 4 hours, or 6-9 on low. After cooking, shred chicken with two forks directly inside of the crock pot. Serve with your favorite sides and garnish with shredded cheddar cheese, a lime wedge and chopped fresh cilantro! This was sooo tasty! It was also really filling. My 17 momth old yummed it down!